I ran outside yesterday! Our neighborhood still has a lot of slush and ice, so I couldn't run here, but I drove to the State Park in the hopes that their paved trail was clear. 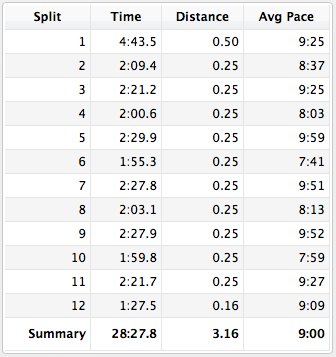 Yesterday was speed work, according to the Higdon schedule that I'm following now, and it was simply 5 x 400 at 5K pace. (Basically, that means running a quarter-mile at 5K race-pace, and then jogging for a quarter-mile, and repeating for a total of 5 times). I got to the State Park, and started with a half-mile warm-up. I was disappointed to see that the trail wasn't entirely clear. I was dodging patches of ice, which is the worst when it comes to speed work. I decided to just do my best in the circumstances, knowing that I may have to stop at walk mid-interval. Needless to say, my split times were all over the place by the time I finished the three-mile run. My "fast" interval paces were 8:37, 8:03, 7:41, 8:13, and 7:59... hahaha, very consistent. The only one that was unhindered by the ice was the third. But I was mostly curious about my heart rate outside, because it's been so high lately on the treadmill. Turns out that it was higher than usual during the interval run also, even during the recovery. A few people have mentioned that I may want to get my iron/ferritin levels checked, because that could be why I'm feeling so drained on my runs even though my heart rate shows I'm working hard. Our insurance kicks in next week, so I'm going to make an appointment for a check-up and the blood work. This morning, I went back to the State Park for a three-mile easy run. I was bummed to see that I forgot my heart rate monitor, but I didn't go home to get it. I definitely felt like I was working harder than usual, even though I was running at a slower pace. But it was so nice to get outside and run! I'll probably be going to the State Park quite a bit until the streets in my neighborhood are clear. We need one really warm day to melt all this snow! My mom talked to Mark's nephew today to get an update on what's going on with Mark. He's going to be staying at the nursing home for three more weeks while he continues his physical therapy, and then he'll have to leave. Since Mark is doing so well with the physical therapy, and may even be walking with a walker by the time he leaves, he's going to be able to go back to his group home. This is really great news! Mark has been asking to go "home" to his group foster home ever since he was admitted to the hospital; and when they saw how advanced his cancer was, it didn't look like he'd be going back home at all. My parents are still hoping that when Mark has to leave his group home for hospice care, that he'll be able to go to their house, but the fact that he can go to his group home again, at least temporarily, is exciting. Remember how I wrote when Mark got some money here and there in his cards, I put it in an envelope with his name on it, and asked him what he'd like to do with it? I told him he could just tell me what he wants to buy and I'll go buy it for him. He thought about it, but the only thing he could come up with was to have a pizza party at the group home. He wanted to spend his money on pizza and cake for everyone. Now, it looks like he'll actually be able to do that! In a couple of weeks, once he's a little more mobile, we'll take him to the group home and have a little party for him there, complete with pizza and cake. I'm so excited for him! Not only for the party, but that he gets to go home for a little while, where he's comfortable (and it's only a 20-minute drive to go see him there, rather than 45 minutes to the nursing home). His nephew is going to visit him tomorrow, so I'm going to go on Thursday. I asked Mark if there was anything he wanted me to bring, but he couldn't really think of anything (other than a milkshake and/or coffee). I suggested a comfortable hat, because he lost his hair, and he really liked that idea. So tomorrow, I'm going to see if I can find a thin, comfortable hat for him. Watch that ice~ the last thing you want is an injury, Katie! YEAH FOR MARK!! That is FANTASTIC news. Thank you so much for sharing :o). So exciting that Mark gets to go home for awhile! My kids just made him some cards today. Hope he likes crayon art, cause my kids went a little wild... can't even read their cards anymore, it's all drawings. :) Hopefully I remember to get them in the mailbox tomorrow, I'm terrible with that! I think my body tensed up just imagining you running in that ice/snow. Ugh! I never did like the ice, but I think living in the South for the past few years is turning me into a wuss. :) Be careful out there. Yes, I got anxiety just reading and looking at that picture. I guess that's what happens when you are recovering from a shoulder fracture due to a slip and fall. I swear I walk around like an old lady everywhere I go now. Are you getting any rest days? That might be why your HR is higher than usual too and why you're fatigued. Even on your rest days you seem to be going on long walks or doing wii fit. Your body wasn't meant to be pushed every day. Try taking a few rest days where you really just rest- no walking other than leisurely walks (no fast walks) that are short and no strength training those days either. I hope I'm not saying something that you haven't already heard.. but just try it. Just as a follow up, I thought you would like to read this: http://www.ericadhouse.com/when-healthy-becomes-unhealthy/ (I just read her blog too, I'm not affiliated with her or anything) and I thought it was interesting because it kind of echoes what you said too after you started visiting Mark (relaxing your lifestyle a little) and she met her boyfriend- following a rigid lifestyle isn't ideal and it takes important people in our lives to remind us of that. Good luck with your doctor visit. (FYI I'm a 3rd year resident in internal medicine ie a doctor). Fatigue and high HR can be a sign of overtraining. But I guess you can be checked for anemia and thyroid function. A good sign of if everything is working right is also whether or not you are having normal menstruations- obviously don't expect you to share that with me, but if you aren't, that would support the thyroid or overtraining theories (besides a few other possibilities). Sorry for this pedantic excessively long post, but I hope you find it helpful. I cried some happy tears for Mark. That is fantastic news!!! If you're going to the doctor anyway, it would be worth having them run thyroid numbers as well -- this is roughly how I felt before I got diagnosed as hyperthyroid. I can definitely relate, it was very frustrating to try to run and feel like my heart was working super-hard even though I couldn't keep up with the pace I'd been able to do a month earlier! You should organize a real race! 454 people? Wow! So happy to hear the news about Mark! You are a brave woman for running on that icy path! Sending warm thoughts your way for the snow to melt! So glad to hear that Mark is going to be able to go home for a while...I know from experience with my own family members that that is such a mental boost. Strangely enough, I'm dealing with the same issue of weird heart rate and fatigue right now as well...I'll be so interested to see what you find out! That is wonderful news about Mark being able to go home for a bit. I'm sure he'll have a wonderful time and thank you again for all that you do for him. Around here in central IL we have the same icy/crappy roads and trails. Last night I did a 3 mile outside because the two treadmills at our fitness center were taken and I had to walk quite a few times to avoid falling. I don't mind the cold or the wind (even though it isn't ideal), it is the ice I wish would go away!! Here's hoping that your area and mine get a warmer day to melt all the ice/snow!